TBILISI, DFWatch–An environmental group in Georgia warned two years ago that constructing a hydro power station in Dariali Valley would increase the risk of landslides. 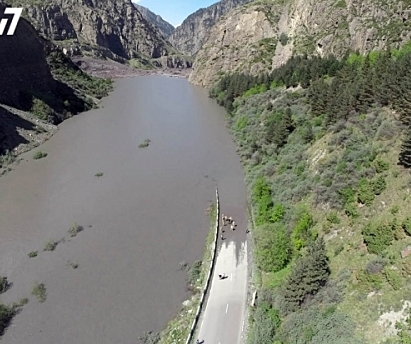 Five people are missing and a hundred and fifty have been rescued out of the disaster area in the north of Georgia where a massive one million cubic meters of rock tumbled down the hillsides Saturday morning, clogging the river Tergi, and cutting of the only road through the Caucasus mountains, as well as the gas supply from Russia to Armenia. In the evening, there was still no confirmation of early reports that three Turkish construction workers had been killed, who reportedly were there in connection with a hydro power project. The mountainous area is naturally prone to landslides, and a major incident happens every other year. But it has been debated whether building hydro power development might increase the risk because of changes in the water flow. The government in 2011 gave permission to construct three hydro power stations, Larsi, Dariali and Kazbegi, all on the river Tergi and one of its tributaries, under the ownership of the same company. Larsi finished, while the two others are under construction. But the group Green Alternative warned in July 2012 that building the hydro power plant might increase the risk of natural disasters and filed a complaint against the company behind all three projects; Dariali Energy. The organization warned the company that by diverting 80-90% of water increases risk of harmful damages to the Dariali Valley as well as occurrence of natural disasters. Green Alternative wants the impact assessment annulled and the project stopped. In 2012, it filed a complaint against the company, a case currently under investigation, because construction was started without a permit – this was given only two months later. Also, because the company did not have a public discussion about the plans. Dariali hydro power plant includes a protected area that was part of Kazbegi National Park, but freed of its protection status. Deputy Energy Minister Ilia Eloshvili told Interpressnews Saturday that the Larsi hydro power project was not the cause of the accident.